Amazon's been a busy bee these past few weeks. Not only has it put out a brand-new Amazon Echo, the smart-home focused Echo Plus, revealed the screen-packing Echo Spot and launched a new waterproof Kindle Oasis, it's also been quietly working on software audio tweaks for its new speakers. The latest update, quietly pushed over the air this past weekend, focuses on the audio performance of the new standard Amazon Echo. And it's all about that bass. While the new Echo is no slouch in the audio department, with Dolby processing now included, we noted in our review that "it’s more in the lower levels where the Echo starts to strain". The new update should address that lacking bass response a tad, aiming to up the low frequency quality without smothering the mids and highs. To check whether your new Echo has received the update, head to the Alexa app and hit the settings pane. There you'll find the version number, with the update in question being number 592452420. The update should bring the audio performance of the new Amazon Echo more in line with the premium Amazon Echo Plus, and, given that it's substantially cheaper, should make choosing between the two speakers all the more easy, provided you don't need the Echo Plus's smart home hub capabilities. 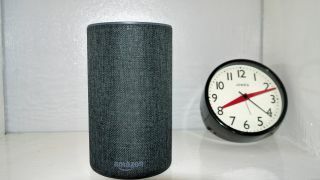 With the latest wave of Echo speakers having been on shelves for less than a fortnight, and criticism of the original audio performance being fresher still, it's great to see Amazon moving so quickly to address issues – although you could argue that, with increased competition from Google Assistant / Google Home speakers and the forthcoming Apple HomePod, it doesn't have a choice. The smart speaker race is now truly hotting up. The entire Amazon Echo line-up explained: which smart speaker is right for you?